A typical software project will have a team of developers, each running their own development environment. Then there will be several more boxes created for test, pre-production and production environments. Unless they’re standardized, there’s a risk these environments can fall out-of-sync. If an over eager ops engineer installs the latest update for MySql, code that runs fine locally can suddenly start failing on production. The easiest way of ensuring the same software is on every environment is to use Virtual Machines. In my current project we use VirtualBox to run the VM. It is configured with Vagrant and Docker. …and many more. Although I develop on Windows, each of these services runs on the same Ubunto Linux distro we deploy to. Each of the service is available from the host computer using Port Forwarding. So if a new developer joins the team, they can simply grab the latest source code and run “vagrant up”. This will spin up a new Virtual Machine, and upon completion each of the services is available on their typical ports. They’re ready to develop! There are plenty of primers out there for using vagrant, so we’ll focus in on how Vagrant can use Docker to easily install and configure the software – a process called Provisioning. This is made possible using a vagrant plugin (vagrant-docker-compose) that let’s us provision using Docker Compose. puts "Requires Vagrant plugin for docker-compose, installing..."
puts "docker-compose plugin installed, please run `vagrant up` again"
The docker-compose.yml file contains the list of all the software to be provisioned on the VM, along with the ports to make it available on. Branch by abstraction: a pattern for making large-scale changes to your application incrementally on mainline. What problem are we trying to solve with this technique? The scenario is that we want to undertake a large-scale refactoring on a piece of software. However, we still want to push out regular releases during the refactoring periods, so we can’t break the software whilst the refactoring is under way. At any point we want to be able to push out an new update with everything working. One solution might be to use feature branching. In this case we’d create a new branch for the refactoring, and upon completion we’d merge the code back into the trunk. This might be a viable solution, or we might decide that we don’t want to keep changes on a long-running branch, or that the merging will be significantly painful and that we’re prefer to take an approach that avoided it. This might well be the decision if the refactoring is significantly large that it takes weeks or months to complete the change. The arguments for and against branching are too big and painful to get into here. An alternative is to use “Branch by Abstraction”. The name is slightly misleading as no branching is involved. Instead this technique describes an alternative to branching where all development work continues to be done on the trunk, which is kept in a stable state throughout. 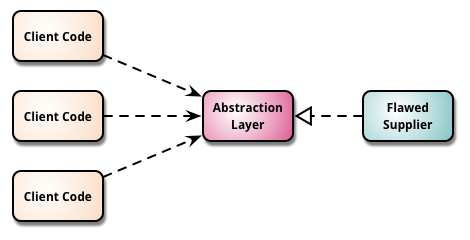 Changes are instead performed by introducing abstraction. 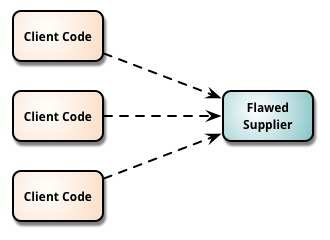 At the point where nothing is reliant on it, the initial flawed supplier code can be deleted, along with the abstraction layer which has now fulfilled it’s purpose. 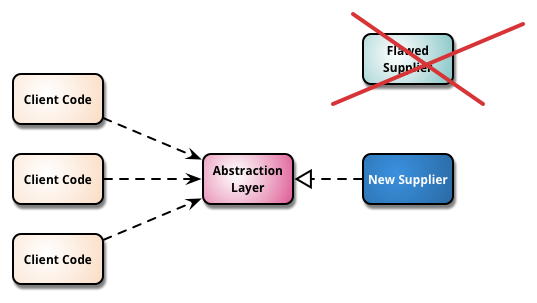 So the underlying idea is to create a single abstraction of the supplier, and then to create multiple implementations of that abstraction which can exist side-by-side. We can then migrate from the old implementation to the new implementation at our own speed, until it has been replaced completely. Create an abstraction over the part of the system that you need to change. 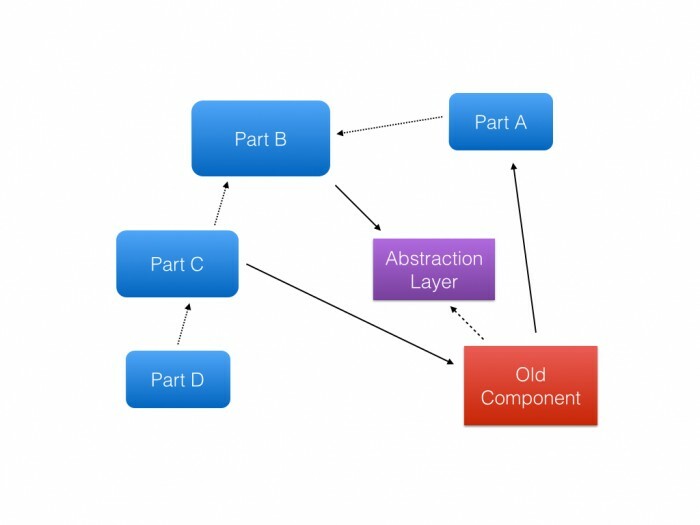 Refactor the rest of the system to use the abstraction layer. Create new classes in your new implementation, and have your abstraction layer delegate to the old or the new classes as required. Rinse and repeat the previous two steps, shipping your system in the meantime if desired. Once the old implementation has been completely replaced, you can remove the abstraction layer if you like. Code which is already follows decent SOLID principles, especially using dependency inversion and the interface segregation principles will be easier to refactor using these techniques, as the interface makes a natural place to introduce the abstraction layer. Although not mentioned in the Martin Fowler article, it’s possible to also use feature toggles to switch between the two implementations, or to slowly roll out the new supplier to individual accounts. What are the benefits of this approach? As mentioned, the goal is to keep the code deployable at any stage. The code “works” at all times, so only the team involved in the refactoring are affected by the change. It avoids merging. Confidence may be higher when committing micro-changes on a regular basis, as opposed to a larger single change at the end of a branch. Adding the abstraction may also help improve the modelling of the application in it’s own right. I’ve recently headed up a new project at work and we’ve switched from using a fairly arcane system of numbering our builds based on the svn build number and the phases of the moon to Semantic Versioning, or “SemVer” for short. Each number conveys some meaning to the user about what has changed in the update. The Major version should be incremented whenever a breaking change is introduced. The Minor version should be incremented whenever a new feature is added but backwards compatibility is maintained. The Patch version should in incremented whenever a bug fix is added but backwards compatibility is maintained. This means that when you see the version number change for a dependency which uses semvar, you’re given some important context information about what the change means for you. If the patch number changes, then you should know the change is limited to bug fixes – feel free to update to the newer version without worrying about anything changing or breaking. If the minor version changes then similarly you can feel safe in updating, but you might want to check to see what new features have been added. If the major version changes then you can expect breaking changes – you may need to do some work to keep your code working if you update to the latest version. (By the way, to install Ruby on your Windows machine I’d recommend using Chocolatey as it’ll also allow you to easily install the dev kit using the following packages: ruby, ruby2.devkit. The dev kit will be needed later in this article for working with the Albacore gem in Rake). Note that incrementing the Minor version resets the Patch version back to zero. Note that incrementing the Major version resets both the Minor and Patch versions back to zero. This is all well and good, but how do I use the semvar file to actually version a .NET project? The Semantic Version will be used within our build process by Rake. Rake is a build language which can be used to define tasks which help you build, test and deploy code. These tasks are stored within a rakefile, which is simply a Ruby file that can be stored alongside your .semver file at the root of your solution. We’d previously used MsBuild as our build language, but that has proved to often be painful as it involves working with verbose XML files, whilst Rake uses a comparatively clean domain specific language. If you ever need to do any complex or unusual then you have the entire Ruby language at your disposal. However Rake isn’t just for Ruby projects – by using a gem called Albacore, Rake can work with .NET tools like NUnit, MsBuild and (in our new project’s case) Mono’s xBuild. (To be continued with examples of wiring Rake up to use the semvar file to automatically version a .NET project). I’ve made a GitHub repository with a working example of this technique here. At work today we wanted to write an integration test for some code that would trigger a job by publishing a message to a RabbitMQ queue. This message would be consumed by a worker program that would perform a long running job expected to take two or three seconds to complete, and the result would be written to a database. After this job completed, the code published a second event to another queue to signal that the work was complete. In our integration test we could publish the first trigger message, but this meant the processing would take place asynchronously. This gave us the problem of figuring out when the job had completed so we could run our assert statements in order to make sure the data was in the correct state. The two obvious approaches were to poll the database at regular intervals to check for the result, or to respond to the completion event. We decided the correct approach was the second but this lead to some real difficulties as there are a few things happening asynchronously. // Other message data goes here. // Load data to check here. // More asserts go here. The AutoResetEvent’s WaitOne method is used to make the code wait 30 seconds unless it receives a signal from the Set method. The test subscribes to the JobCompleted event and if it’s recieves a message it calls the Set method which sends the signal to unblock the thread. At this point we can safely proceed with the asserts on the original thread as we know the data has been written to the database at this point. If the 30 seconds passes without the JobCompleted message being received, then Assert.Fail is called with an appropriate timeout message. The end result is the tests complete as quickly as possible (faster than waiting for the next database polling cycle) and we get a bit of performance testing thrown in for free! You’re told to search the list and draw a circle around every example of a certain first name. How might you approach searching the list? You’d have to go through every single name in turn. You couldn’t stop when you found the first name you cared about – you’d still have to carry on all the way through to the very last name on the list to make sure you’d found every instance of the name on there. If the list was short (say 10 or so names) then this process might seem trivial. Scanning through the list of names takes no time or effort at all. But the longer the list of names becomes, the longer it’s going to take you to search all the way through. Once you’re into hundreds or even thousands of names, searching the list starts to become a major headache. How about if you put the names in alphabetical order (by first name) and tried the search again? This would make the search a lot easier. You could skip straight through the names at the start to the beginning of the block of names you cared about. Then you could read through all the examples of the first name you were searching for, and you could ignore any of the remaining names in the list as you knew you wouldn’t have to care about any them. Much faster. However sometimes you also want to search the list by surname, so scrapping the original list and re-ordering it alphabetically doesn’t always help you. Instead you’re given a separate list of first names, in alphabetical order along with the numbers that allows you to quickly find the names in the original list. This is an index. By searching the index for the first name you can easily grab the list of names from the original list. The index doesn’t contain the surnames, just the first name as that’s the thing you’ll be using to search on. You’d still have to read the surname back off the original list. If you also wanted to search by surname, you could create another index, this time with the surnames in alphabetical order. What would happen if you then wanted to change the original list? Maybe you wanted to add a few more names at the end, or update a few of the names in the middle somewhere? Well, you’d also have to make a corresponding update to any of the indexes that were affected. You may be starting to see some of the upsides and downsides of using an index. An index helps you search a list quickly, but it doesn’t come for free. You need some extra paper to write your index on, and you have to do a bit of work to maintain your index every time you make a change to the original list. If your list is quite short this might be more hastle than it’s worth. And if you have a list that you update all the time, you’re also going to have to constantly updating the indexes on your list. This creates a table with three columns. There is “Id” column that starts at 1 and increases by 1 for every row we add to the table. This is the primary key on the table. There is also a “FirstName” column, and a “LastName” column. Both of these can hold some text. Just by creating a table with a primary key we’ve already got our first index on the table. When you create a primary key on a table (in this case for our “Id” column”) it will automatically be used to create an Implicit Index. It makes sense that we’d want to use our primary key to look up rows quickly. This tells us a bit about the index that was created. The name of the index is “PRIMARY”, and as you might expect it is a Unique index. This means the index will enforce uniqueness across each of it’s entries (which of course makes complete sense for a Primary Key). The Cardinality is the number of unique rows in the index. In this case because we have 0 zero rows in the table, it returns 0. The BTree value refers to the way the actual index is stored. This may be interesting to you, but the way the data in the index is stored is invisible to you when you’re using the table so you can definitely get away without knowing too much about it. (By the way, I’ve created this list using a site called GenerateData which is a useful tool for easily creating dummy data like this). Note that if you check the indexes again on the table, the cardinality for the PRIMARY index is now 100 – as there are 100 unique ID values in the table. As we had expected this reveals that our Select query performed a search of all 100 rows in the table. We can see from the Type value of All that a full table scan was done. Every row in the Customer table had to be searched to make sure all the Ramona’s had been found. Only a single row was read to perform this search. The possible_keys column shows the list of indexes the search could have made use of, and the key column shows the actual index it chose (in this case there is only a single index to choose from – PRIMARY). (If you’re interested in reading the other outputs of EXPLAIN, this article may be useful). This will create a Non-Unique Index – there is no restriction on only having one of each first name, which is exactly what we want in this case. You could try and create a unique index (using the syntax CREATE UNIQUE INDEX) but this would fail due to their being duplicate first names already in the database. Now we only search the two rows that have Ramona as a first name. Much better. We can see that our new index FirstName_IDX is being used as expected. You can also create indexes that use multiple columns. Hopefully this article has given you a decent overview of what problem an index helps solve, alongside some of the pros and cons to using them. The database is commonly a bottleneck in web development. Use EXPLAIN to look for places in slow-running queries where full table scans are being undertaken, and consider whether an Index would drastically cut down the number of rows that need to be searched. On larger tables this can lead to massive gains in the speed of your queries. Adding indexes everywhere is not a great idea however as they do come with an overhead. You need to understand what your queries are doing and only add the appropriate Indexes. We’re rolling Redis caching into our project at work, so I though I’d give it a dummy run by first adding it into the Park Run site I made over the weekend. Is this overkill for such a simple site? Absolutely. The site works by screen scraping data from the official park run site. This is actually super-fast and there are no traffic considerations, so this is purely a learning exercise. The Redis cache on Azure is brand new – right now it’s so new it’s only available via the Azure preview portal. Setup is simple, the only decisions I needed to make were the name, and to change the default location to Northern Europe (the same as the site). Once the cache is created you can access the HostName and Keys you’ll need to connect to the cache from your code. The client I’ve used is StackExchange.Redis (at work we need running on Mono so we’re using a fork of ServiceStack called NServiceStack), which can be installed into your project with Nuget. //Screen scraping code goes here. Been trying all year, but finally broke 5km in 20 mins at park run this morning! First New Year’s resolution I’ve actually seen through?